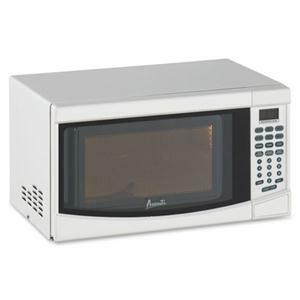 Microwave oven features an electronic control panel, one-touch cooking programs, a 0.7 cubic foot capacity, 10 power levels and 700 watts of cooking power. Open the door with a push-button latch for easy access. Microwave oven also includes a defrost function and 60-minute cooking timer. The sleek design also features speed defrost, cook/defrost by weight, and a digital cooking timer with the added convenience of a kitchen timer and a removable glass turntable.